That's a cool-looking bicycle, huh, motorcycle. Jawa is on the rise again. Royal Enfield’s former nemesis is gaining momentum once more with the goal of giving the Royal a run for its money. While for the past few decades, the Czech brand has been flying under the radar, it doesn’t mean it didn’t come up with a few rides worthy of mention. Especially when one of them shows up in a barn in pristine condition. Reddit is a goldmine of barn and crate finds, little dusty time capsules found in forgotten garages. 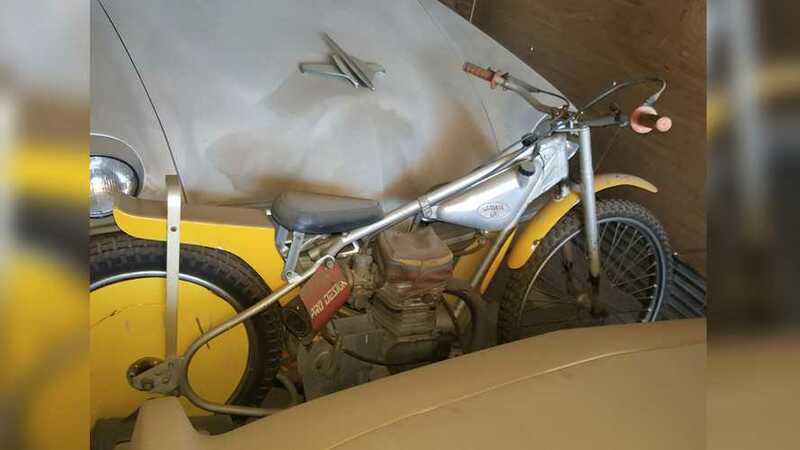 This time, the user apparently got his hands on what appears to be a 1977 Jawa 500 Speedway DT-894 with a modified saddle, guard, and rear wheel. When you lay eyes on it for the first time, this looks more like some sort of bobber-type bicycle with an engine mounted within the triangular frame than an actual bike. What we are looking at, however, is a proper motorcycle powered by a 492cc, four-stroke, single-cylinder engine. This super lightweight machine is capable of producing 60 horsepower for only 187 lb, thanks among other things to the miniature 2-liter (or half a gallon) gas tank. According to an original Jawa owner’s manual, the bike has actually been built for racing purposes, for dirt or paved tracks of up to 500 m (roughly a quarter mile), thus the appropriate “Speedway” nomenclature. When I said earlier the motorcycle looks like a bike, I wasn’t exaggerating. The exposed steel tube frame is very similar to that of its pedal-powered counterpart and the entire front portion could be mistaken for a bicycles with the dangling exposed wires and absence of a front brake. Some users have speculated that the bike could fetch up to $2,500, while certain versions of the model have sold for more, including a world-championship winner that sold for $21,600 last year at Bonhams’. There’s no mention of a location or a mileage (there’s no odometer!) and while the model was fairly popular in its heyday, this is the kind of find we can all appreciate for its quirkiness.